A type of collaborative conversation to strengthen a person’s motivation and commitment to change. A client-centered counseling addressing common problems people often encounter thinking about making personal changes. Designed to strengthen movement toward a client’s selected goal by eliciting and exploring their reasons for change within a caring atmosphere. Focused on the language of change and other critical elements in conversations about change. Grounded in a solid and growing evidence base. A way to trick someone into doing something or changing in a way that he or she does not want. Manipulating someone into ‘having’ motivation. A panacea, and MI may not work with some people and situations. 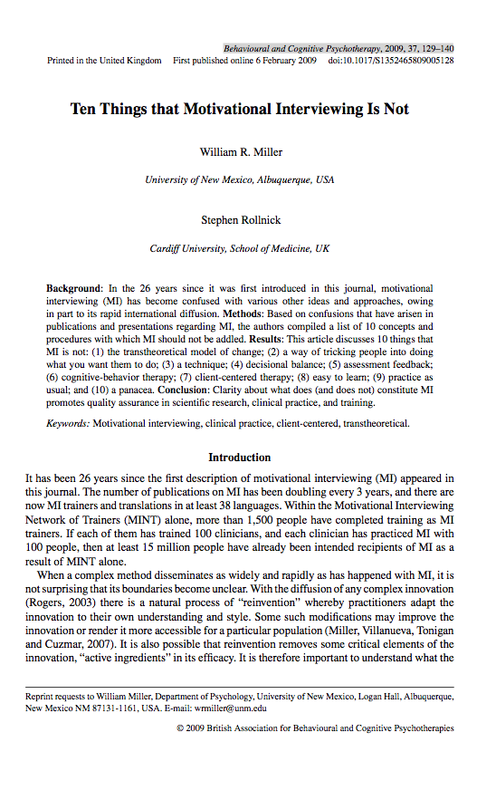 Click here for more resources which explain motivational interviewing.